Hienostopuuseppä - Cello Endpin Stopper product page from Cabinetmaker John Cozens. FOR a musician, either practising at home, or out and about in a rehearsal, clutter on your music stand is a big problem. You need a pencil, a rubber, sometimes a metronome and your phone to keep an eye out for calls. All of this clutter on the stand either blocks your view of the music, or makes turning the page difficult. For you, how many times has the pencil droped on the floor and broken? You need a shelf to put all this stuff on, and Hienostopuuseppä has just the shelf for you! 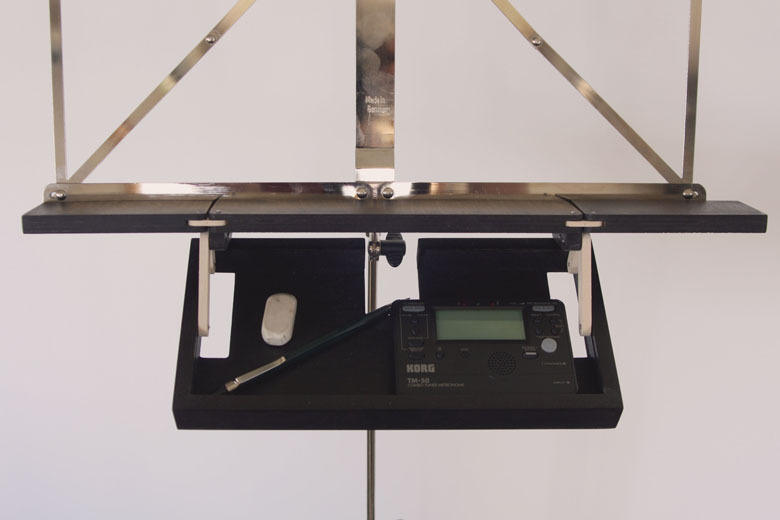 Hienostopuuseppä's music stand shelf is designed for the musician by a musician. The shelf fits in your instrument case or music holdall. Its smaller than a A4 page and as thin as I can make it at 24mm thick. 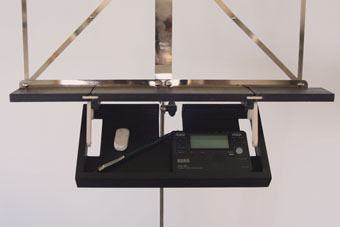 It can be quickly unfolded and slots easily onto the music stand - no screws are needed. When its in place, there are no clips to stop a quick page turn. When you're finished playing, just fold it up and go. The shelfs are handmade in Finland and are made of birch plywood. 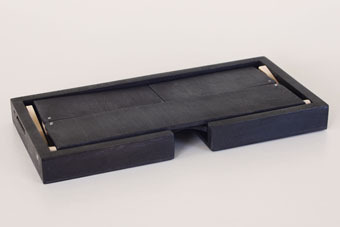 They are designed especially for fold-up collapsible desk music stands such as those made by K&M etc. Currently the shelf only comes in a black colour, but you can always ask about other colours (see my Cello Stoppers page for colour examples). The shelf costs 45 € (24% VAT, not including postage and packing. Note that in the EU your local VAT rate will be applied automatically. Outside of the EU VAT is not charged). Send an email to john ( at ) hienostopuuseppa.fi or a personal message in Facebook if you would like to order a music stand shelf. Please note that these are handmade wooden products, and might break if droped or handled roughly, so they may not be suitable for very small children. If there are shelves in stock, then delivery time can be between a few days and a few weeks depending on your location. I can give an estimate if required.